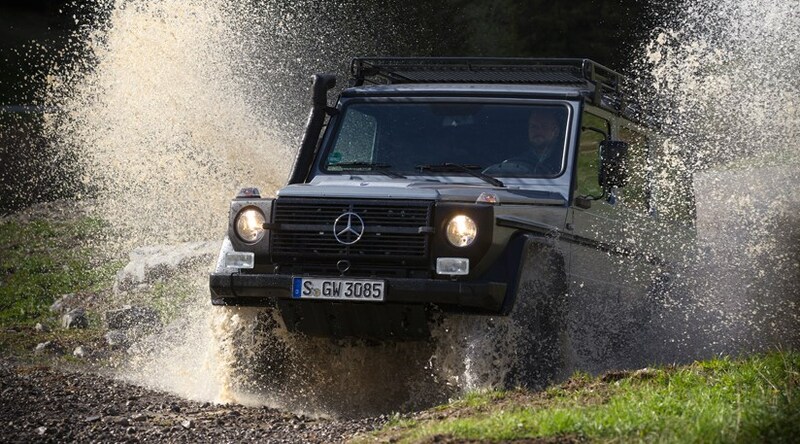 Mercedes is considering a small G-wagen-inspired SUV to tackle the upcoming Land Rover Defender replacement in 2015, as well as modernising the G’s charming but rather outdated form. Likely christened as ‘GLG’, the new car will get G-wagen styling cues, a range of downsized engines, and a hot AMG version with around 350bhp. On the continent, Mercedes will sell you a BMW X3-sized SUV called GLK. The angular styling was partly inspired by the good ol’ fashioned G-wagen, but its polarising looks and lack of right-hand drive option limited the sales potential for the car. The GLG is designed to reclaim lost ground in the popular crossover segment, and would sit on the MFA platform of the new Mercedes A-class. Codenamed X156 and internally nicknamed ‘mini-G’, the car is ostensibly a mud-plugging sister to the road-biased GLA coupe-crossover that’ll arrive in 2014. Yes, Merc is planning two separate crossovers based on the new A-class family. The 'mini-G' will instead show off a taller, more upright stance, and visual links to the original G-wagen. The roof will be long and almost horizontal all the way back to the upright tailgate, while the butch and geometric wheelhouses appear grafted onto the slab-sided body. This boxy styling hints to buyers at plenty of space and excellent visibility, hopes Mercedes. Other G cues that could be incorporated include an external spare wheel mounted on an asymmetric carrier, boxed-off taillights integrated in the rear bumper, front wing-top indicators, round headlamps and full-length rubbing strips. However, the aerodynamics will be necessarily superior to the barn-door G-class. What about underneath the boxy styling of the Mercedes GLG? Despite the workmanlike pretensions, Mercedes is considering a front-wheel drive version of the Mini-G. It might seem unthinkable, but Land Rover is also preparing a two-wheel drive version of its future workhorse. Having said that, Merc does expect a high take-up for the 4Matic versions which distribute torque between the axles via a Haldex clutch and the on-board computers rather than the original G-wagen’s three separate diff locks. If you crave off-road go to match the show, there’s the option of a GLK-inspired tech pack featuring hill descent control, special 4WD drive mode selector, stacked suspension and skid plates. As for under the bonnet, the engine line-up will be largely identical to the A and B-class motors. Petrols come in the form of a 1.6-litre with 122bhp, or a 2.0-litre with either 156bhp or 211bhp. Meanwhile, there are four diesels to be offered: a 1.8-litre/109bhp, and a 2.1-litre in differing states of tune good for 136bhp, 170bhp, or 204bhp. For performance nuts, the range will be topped by a 350bhp GLG45 AMG equipped with stronger brakes, a seven-speed automatic gearbox, quicker steering and a re-engineered front axle. Another niche busted! When can I buy a Mercedes ‘mini-G’? CAR’s sources report that the ‘mini-G’ is definitely first in line for approval, ahead of all other options waiting in the wings, like A-class coupé and cabrio, or B-class saloon and larger MPV.